Dr. Rifkind is the current Vice President of the Comics Studies Society and a participant in the hashtag, #womenonpanels. She graciously answered my questions about the project’s aim and scope while traveling for sabbatical! It looks to me from reading the “about” page on the GraphicBio website that the project was to examine your chosen core 25 graphic biographies, in a variety of ways—solo, with students, in discussion with your fellows, as book club selections, as fodder for book reviews, and applying theory in multiple ways. Thus, the website itself is only one result of this project, and the actual classes taught, the papers published elsewhere, and the presentations given at different conferences and conventions are also results of the project. Does that characterize the project accurately? From the beginning, the project was always about generating discussions in a variety of venues, collaborating with students and colleagues, and bringing academic comics studies into conversation with a more general comics readership. The first task of the project was to think about graphic biography as a distinct genre of graphic life narratives. While it shares some features with the more critically-acclaimed genre of graphic autobiography and memoir, graphic biography is different because it requires a cartoonist to draw the life of another person, not themselves. And that’s where things get really interesting artistically, because often the person whose life is being drawn was famous, so there are a lot visual images already circulating of them. The cartoonist has to find a unique way to depict someone we can already picture of in our minds’ eyes and whose life story we may think we know very well. Philosophically, graphic biography also poses tough questions for cartoonists and readers about claiming to have intimate knowledge of another’s person’s thoughts, feelings, and private lives. But how can we possibly know what another person’s life was really like? How much liberty can the artist take in depicting it? How much of themselves does the cartoonist inevitably project onto the pages of somebody else’s life? Before you applied for funding from the Insight grant, how did the idea for this project arise? I’m sure you are used to people remarking how graphic memoir is much more standard a subject of study, and I see that you even have a section on the bibliography including autobio. Were you reacting to that in your selection of focus? The kernel of the idea to focus on graphic biography came from working on Seth’s fictional graphic biography, George Sprott. As someone who focuses mainly on Canadian alternative comics and graphic novels, I’ve taught and written about Seth’s work a lot, but George Sprott grabbed my attention because Seth’s narrative persona describes George’s life at the same time he admits his failures in ever being able to give a true picture of the man. Seth’s self-deprecating narrator is very different from the kind of all-knowing, authoritative narrator we usually get in biographies, so I started to wonder if other cartoonists were breaking free from that older model of traditional prose biography. Comics are especially suited to illustrating the gaps in any attempt at a comprehensive biography because the panel/gutter structure invites us to think about lives as moments interrupted by gaps, and the reader has to figure out what happened in those gaps. We have to make the individual moments of the panels add up to a story that makes sense, and alternative cartoonists can play around with that self-consciously to remind us that the ideas we may have of people’s lives as one long, continuous, sequential narrative is really an illusion. Also, there is the visual pun in a lot of graphic biographies that we live our lives in little boxes, and that subjects whose lives are really worth drawing are those who break out of pressures to conform to societal expectations. So, cartoonists can have their subjects breaking out of the grid, or they can lay a grid over a single drawing of their subject, or they can eschew the grid altogether for experiments in layering and non-sequential imagery. Another alternative Canadian cartoonist whose work I admire is Ho Che Anderson. His metabiography of Martin Luther King Jr., King, uses a variety of visual styles to show us the life of the ‘great man’ it depicts at the same time it pokes holes in his saintly image. Seth and Anderson inspired me to look for more graphic biographies that push conventional ideas of biography through experimental, even avant-garde visual styles that mobilize all of the possibilities of the comics form. I was also reacting to the gap in academic comics studies around graphic biography. Autobiography has dominated a lot of the scholarship, in part because of the critical attention paid to the now canonical works Maus by Art Spiegelman, Persepolis by Marjane Satrapi, and Fun Home by Alison Bechdel. I don’t want to diminish the significance of these works, or the scholarship on them that helped to legitimized academic comics studies, but I still feel graphic biography deserves more attention than it has received. Since I started the project five years ago, even more alternative cartoonists are drawn to graphic biography as a way to respond to celebrity culture, redraw history, and identify with real people whose stories they feel need retelling. I read the parameters of your sample (not mass market, from specific continents, subjects in a range of professions); within those, how did you select the 25 graphic bios that were your focus? Were you attempting any kind of balance between different demographics? Were you considering both cartoonists and subjects in those demographics? It was really hard to set the parameters of the project, but I did begin with the idea of focusing on alternative cartoonists, rather than the mass market and educational graphic biographies targeted mainly at young readers to provide edifying examples for them to emulate. I also wanted to make sure that female cartoonists and subjects were well represented, as well as people of colour, because one of my main arguments is that graphic biographers challenge the “great white men” model of traditional biography. I also wanted to make sure that female cartoonists and subjects were well represented, as well as people of colour, because one of my main arguments is that graphic biographers challenge the “great white men” model of traditional biography. As I started to make my long list, I noticed clusters of graphic biographies around the professional achievements of the subjects and it seemed productive to set up five sub-categories of graphic biographies: political leaders (especially radicals and activists), athletes (baseball and basketball seem to dominate, as do questions of race, ethnicity, and masculinity), scientists (atomic science has been particularly appealing to cartoonists), artists (performing artists such as dancers as well as visual artists such painters), and musicians (both groups and individuals). Once I had these sub-categories in place, I started to think about the range of life stories I wanted to study, and once again I paid attention to diversity and demographics in arriving at a short list. As the project started to take shape around subjects who are recognized for their professional achievements, but whose private lives are of equal or even more interest, I had to make some difficult decisions about what couldn’t be included. For instance, I decided that works about multiple subjects, or auto/biographies where the cartoonist draws her own life in relation to someone else, were a different topic. Similarly, as I started to focus on graphic biographies that redraw famous lives, often debunking the biomythologies about well-known figures, I had to reluctantly leave graphic biographies of less famous, ordinary people for another project. What determined whether a specific one of the core books would get a review on the website? The website book reviews were all written by the three graduate students who served as Research Fellows on the project and were mostly selected by them from the core group, according to their interests. I tried to ensure the reviewed books represented the range of subjects in the project, but mostly I wanted the graduate students to develop their own interests within the project and find topics they could develop for their own publications. I notice that two of the graduate student fellows associated with the project both reviewed The Boxer, offering different perspectives with different priorities. Did this project’s focus reveal anything to you about your own priorities as primary researcher, or about those of your fellows? Two of the Research Fellows reviewed The Boxer from quite different points of view. The Boxer is an interesting graphic biography because it was drawn by German cartoonist Reinhard Kleist about Harry Haft, who survived the Holocaust because the SS guards liked to watch him box other Auschwitz prisoners in brutal fights. Haft then immigrated to New York, where he boxed again in the 1950s. There are other elements to this story, but it’s important to note the comic book is based on Haft’s son’s prose biography of his father. There are a lot of filters between what we see on the page and the ‘true’ story of Haft’s life, especially since we know that traumatic experiences play tricks on memory, family members have their own investments in reconstructing life stories, and cartoonists make artistic decisions to draw a compelling and convincing life story. Jessica Fontaine reviewed The Boxer through the lenses of feminist trauma theory and comics studies, exploring how Kleist draws Harry Haft as a subject of violence in the past and present. She also considered the problem for both cartoonist and readers that Haft is not a likeable character and his life story doesn’t lend itself to conventional Hollywood redemption stories. Jamie Michaels is a graphic novelist with a keen interest in the history of Jewish boxing, and so he read The Boxer from the point of view of the writer, looking at where the book succeeds and fails at conveying a sense of authenticity and to what extent it might be exploiting the subject’s traumatic experiences for emotional impact. Both of the reviews were enlightening for me to read: Jessica is such a good reader of how cartoonists produce affect (how they cause a change in the readers’ emotions), while Jamie brings his behind-the-scenes experience working on comic books to his analysis. I think they work really well together to highlight how important it is for comics scholars to learn from comics practitioners, and vice versa. I was particularly intrigued by the idea of a graphic biography of a visual artist, since that would generally include not only depictions of the subject and their world, but also their art. It seems to me that creates adaptations and commentary of their work as well as their life. Were there any categories of graphic bio you felt were particularly rich for analysis? Over the years, did one of the core 25 graphic biographies emerge as your personal favorite? I think it’s fair to say that all of the graphic biographies have to deal with adaptation and remediation of the subject’s professional work into the comic in some way, but it’s particularly noticeable with painters. There’s always going to be a struggle for a cartoonist working in the popular, ‘lowbrow’ form of comics to depict the life story of a subject working in a ‘highbrow’ medium, such as painting. We were interested in how a graphic biographer both redraws the actual paintings and how they might evoke the painters’ style throughout the rest of the book. Barbara Stok’s Vincent uses a colourful, appealing palette to draw Van Gogh’s life and his paintings, but the actual story of his life is full of tragedy and pain, so the style itself comments on the disjunctures between the public and private life as well as the ironies of his posthumous fame. There’s always going to be a struggle for a cartoonist working in the popular, ‘lowbrow’ form of comics to depict the life story of a subject working in a ‘highbrow’ medium, such as painting. We were interested in how a graphic biographer both redraws the actual paintings and how they might evoke the painters’ style throughout the rest of the book. But there are similar challenges for graphic biographers of dancers, musicians, and athletes: how can comics capture the dynamic movement of a body or the auditory experiences of music on the page? Sabrina Jones uses a flowing, Art Nouveau line style to depict Isadora Duncan’s avant-garde dances; Paolo Parisi uses musical notations over the panel grid to convey John Coltrane’s jazz improvisations; and Wilfred Santiago uses an expressionistic, kinetic style to convey Michael Jordan’s skill on the basketball court. This connection between style and subject is one of the most interesting things about graphic biography: to what extent does the cartoonist develop a new style specific to their subject’s life story, historical period, and existing visual portraiture in photography and film? Or, to what extent does the cartoonist’s signature style seem particularly appropriate to their subjects? German graphic biographer Reinhard Kleist is a good case in point here, as his black-and-white expressionistic style seems very well suited to his dark, trauma-filled graphic biographies of Johnny Cash and Holocaust survivor Harry Haft. Other graphic biographers experiment with styles that almost embody their subject’s life and work on the page. For instance, Lauren Redniss used cyanotype (an early form of photographic printing) to create the images for her graphic biography of Marie Curie, Radioactive: A Tale of Love and Fallout. This process depends on exposing images to UV light and was important to the discovery of radium and development of x-rays for which Curie is famous. Redniss almost reanimates Curie in the very method of making her graphic biography, and connects her artistic process to her subject’s scientific contributions in the production as well as narration and illustration of Radioactive. How about theory and criticism? Did one article or book emerge as your personal favorite? Given the relative paucity of theory and criticism on graphic biography specifically, we were working between comics studies and life writing theory most of the time. In terms of comics studies, my work is always informed by the landmark studies that launched comics studies as an interdisciplinary field bridging literary, visual, and cultural studies (Charles Hatfield’s Alternative Comics; Hillary Chute’s Graphic Women; Michale Chaney’s edited collection Graphic Subjects; Thierry Groensteen’s The System of Comics, Barbara Postema’s Narrative Structure in Comics). This project also brings comics studies into conversation with recent life writing theory, and especially the sub-field of biography theory. Some important theorists in this field for my work include Pierre Bourdieu (especially his idea of “the biographical illusion” that we can fully know another person’s life), William Epstein’s work on postmodern biography that reframes the relationship between biographer and subject, and Sidonie Smith and Julia Watson’s body of work on life writing more generally. Hermione Lee, herself a distinguished literary biographer, wrote a small guide called Biography: A Very Short Introduction. She uses two metaphors to describe the main differences between how biographers approach their subjects: a painter producing a portrait of an individual or a forensic surgeon dissecting the life of an individual. I think most of the cartoonists I’ve studied fall somewhere between the two, and Lee’s dichotomy has helped me to think about the cartoonist-subject relationship more clearly. 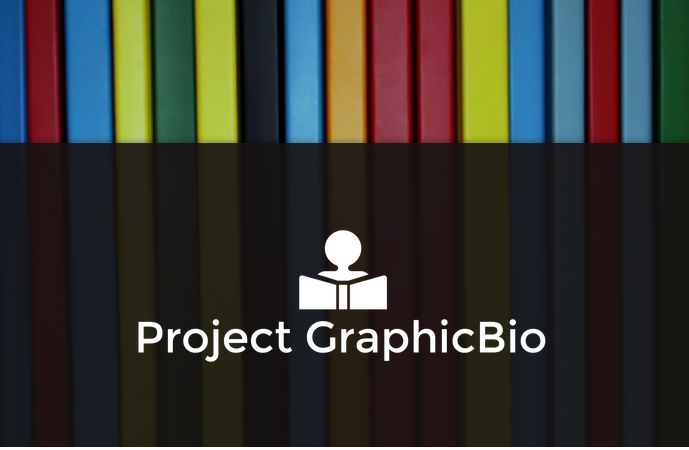 Projects like GraphicBio can illuminate the range of possibilities for graphic narratives by sustained study focusing on the variety in one area of the graphic narrative panoply. I hope that this project can serve as a model for other university studies of subgenre in the field in the future.